Americans who think that the political climate in the United States is tumultuous should be aware of the disarray in its principal ally. On the heels of the evaporation of the Trump–Russia collusion scam (on which the Democrats had placed almost all their bets), the personnel changes at the Department of Homeland Security and the indisputable gravity of the numbers of illegal entries has fragmented the Democrats' backup argument that the border was a "crisis manufactured by the president." Attempted unauthorized border crossings of over 100,000 per month, and the opinions of senior Obama-administration officials, including the former secretary, Jeh Johnson, that this is an urgent national crisis, have almost shut the loudest Democratic mouths screaming "fake emergency." The peppy claims of Democrats that they would overturn the president's declaration of an emergency have tapered off into inaudible grumblings. A moron can see that it's an emergency, and the Democratic media puppets claiming a false crisis have gone almost silent. The United Kingdom is now in the climax of the greatest failure of British national government since the debacle of the American Revolution. Though it is not violent, there has not been such a rending of British national opinion, involving the structure of its vital political institutions, from the War of American Independence to these recent days of intense dispute over Britain's departure from the European Union. The British have earned, over many centuries, the respect of the whole world for their talents at government — in devising durable and adaptable institutions in democratizing but retaining their monarchy, in the greatness of their Parliament at critical moments in the development and defense of democracy, and in the great and generally civilizing influence Britain has exercised over vast swathes of all inhabited continents except South America. To all but a comparative handful of insensate Anglophobes, the general competence and effectiveness of British political life is assumed. The country played the balance of power with often exquisite perceptiveness from the rise of the nation-state in the 16th century to Munich in 1938, and after that fiasco retrieved its error of appeasement with a heroic war that earned for Winston Churchill and his countrymen the homage of the whole world. Though this was not what Mr. Churchill particularly wished, he managed, with the greatest dignity in all history, the transition from being one of the world's co-equal greatest powers to being the principal and influential ally of the stronger of the world's two superpowers with consummate elegance and suavity. And now this premier democratic state, with essentially the same political institutions gradually devolving for 900 years, and no real civil strife or profound upheavals in 370 years, is on a knife-edge of whether it will regain its sovereignty or not. In summary, the European Union, which aspires to "an ever closer union" of its 28 members, has engendered an irregular and unsettled transfer of jurisdiction from the national governments of the member states to a centralized European government in Brussels. It has stirred serious reservations in many member countries over its authoritarian regulation and lack of real accountability, either to member countries' governments or to the toothless talking shop of the European Parliament. In this climate, the former British prime minister, David Cameron, irritated by anti-Eurointegrationist agitation, promised a referendum offering outright departure, "Brexit," as an alternative to the "full-on treaty change" that he promised to negotiate. The negotiation produced only the slightest concession, on social benefits to people arriving from elsewhere in the EU (subject to agreement by all the other member states) — less, as I wrote at the time, than Neville Chamberlain brought back from Munich. Cameron could not imagine that the country would vote to leave, and in cavalier fashion he called the referendum. It was either his piffle of an illusory concession or out: all or nothing. The British voters cannot be treated this way, and they voted, 52 to 48 percent, to leave. In the circumstances, if May can't get a short extension, with all her irresolution and her doughty but unfocused determination, she should leave the EU on Friday. 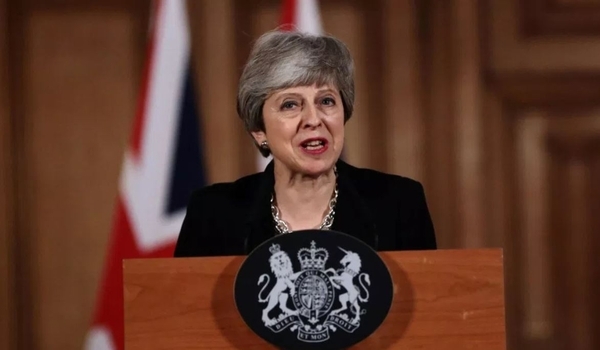 The attempt to terrorize the British voters about the consequences of such a move will be shown to have been a terrible exaggeration, and May would be able to say that she had delivered Brexit to the true believers and done her best to get a soft Brexit for the anti-Brexiteers, and would have until November to shore up her position before her party can give her the high-jump. President Trump has repeatedly offered a fast-track to free trade with the U.S. The United States does not concede any sovereignty, and would not ask it of the British. It is to this absurd state that Her Majesty's government in the United Kingdom is reduced. How comparatively trivial are the authentic policy debates in the U.S.! America is just getting over the most egregious constitutional transgressions in 160 years, but it didn't work, and was exposed and rejected through normal political and legal processes, and the political life of the country goes on. In London, the Mother of Parliaments is accurately described in the British press as a "House of Fools," and the prime minister appears to have no guiding principles in response to the greatest policy crisis since World War II, and not even to possess any of the chicanery of notoriously opportunistic British leaders of the past, such as Benjamin Disraeli, David Lloyd George, or even Harold MacMillan and Harold Wilson. They may not have been long on principle, but they knew how to maneuver. No American should take comfort in the travails of the British, but they can at least be happy that even that most stable and venerable of political systems can sometimes be more perturbed than America in the prodigious controversies of the early Trump era.